The #CaravanForJustice has brought UK activists into contact with those working in their communities to heal from the effects of state violence and brutality. Today included a teach-in at the Fathers and Families empowerment centre in Stockton, San Joaquin County and rally at Salinas, Monterey County. 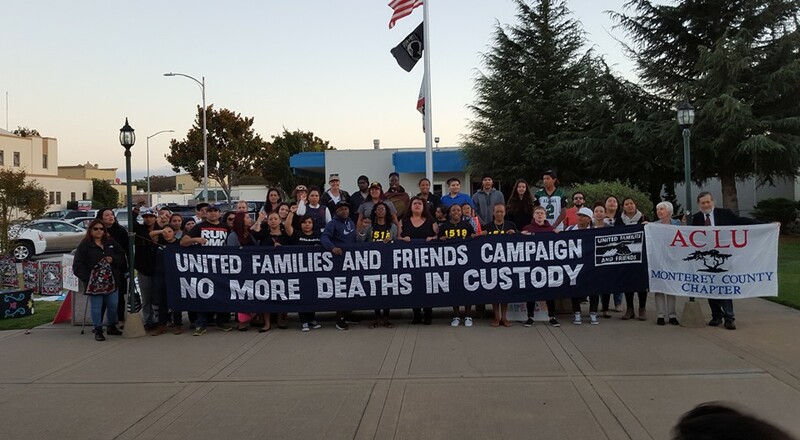 Fathers and Families San Joaquin addresses critical problems such as institutional inequity, fatherless homes, wide spread poverty, employment disparities, inadequate access to public health services, community re-entry and youth on youth violence. Our tour was invited into their centre to share experiences from the United Kingdom whilst learning about their struggle against the detrimental effects of the punitive state. In Stockton, where the school officer arrest policy was implemented in 1991, and San Bernardino, which implemented the policy in 1997, school officers have arrested 34,368 and 59,290 students under age 18, respectively, on criminal charges through 2013. More than 1,800 of those arrested students were under age 10-1,590 in Stockton and 247 in San Bernardino. Stockton Police Department and Stockton Unified School District officers arrest children under age 10 at levels 15 times higher than in Bakersfield, 24 times higher than in Fresno, and 38 times higher than in Sacramento. With this sort of attack on the youngest of their loved ones, communities h ave had to organise to rebuild from the wreckage that is left in the wake of state abuses. Remembrance of those who have been lost and cherishing those still with us has become a big part of the struggle for justice. The family of Frank Alvarados Jr, murdered by Salinas police in 2014, shared his horrific case at the second event of the day. Frank had been to prison and on release campaigned for reinvestment in his community. He was shot dead by police who claim to have confused his cell phone for a weapon. Angelica Garza, Frank’s sister described that ‘[her] brother had a cell phone in his hands, he was shot many many times with a hand gun and about 16 times with a high powered rifle’. Her brother is one of five people killed over the last year in their town: Angel Ruiz, Osmar Hernandez, Carlos Mejia, Jaime Garcia and Frank Alvarado Jr.
Far too often the school to prison pipeline ends in tragic deaths caused by a system that fights accountability at every turn. In Salinas their mayor is a former police officer, the current chief of police killed someone and got away with it and, in a town that is 75% Latino, the DA is a white man. The whole damn system is guilty as hell.